Having lots of time to spend on the train to and from Genoa going to work and back, the options are three – sleeping, reading and knitting. 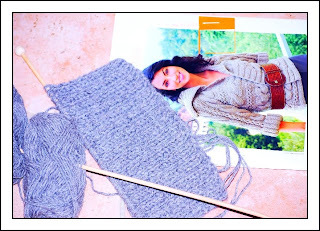 My newest knitting project comes from the Italian magazine “Maglia” that is available at the newspaper stand once a week and comes with about 10 new patterns and a skein of wool. The wool comes in “natural” colours and is intended to create a knitted blanket made of different-patterned squares, not unlike a quilt. The blanket is too much (and a bit too boring) for me, I’d rather use the knitted squares to make pillows (follow the next posts for the evolution of this idea), but the patterns are really beautiful. Unlike most of the knitting stuff available in the magazines, these ones don’t look like from my grandma’s closet. The project I am currently working on is a chunky braided cardigan, knitted all in one piece out of alpaca-merino wool taken as a double thread. The results till now are lovely – thanks to the double thread the work goes on fast, and I am quite intrigued by the fact that it’s all a one-piece.